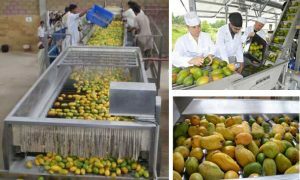 Fruit sorting machine for juice production, quote now! 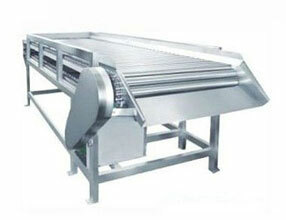 Fruit sorting machine is very important in the fruit production, which is mainly used to pre-process. So which is the superior fruit sorting machine? TICO fruit sorting machine adopts stainless steel and stepless speed adjust device. Stainless steel shaft has smooth surface, which has not harm to the surface of fruits. Stepless speed adjust device can control the working capacity of an hour by running speed. The fruits selected by TICO fruit sorting machine are more quality-proved, which can also guarantee the top quality of fruit juice. Besides, this is my recommended fruit sorting machine considering the cost and benefit. 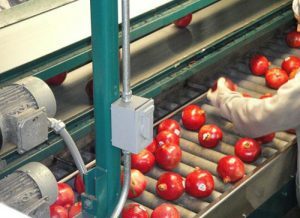 when the fruit sorting machine works, fruit sorting machine can transport fruits, meanwhile, the shafts are rolling and the fruit on the shafts can rotate evenly, so workers can easily pick out low or inferior quality fruits. And spray cleaning device can be installed at outside of the discharge port. TICO fruit sorting machine is mainly designed for transporting, sorting and grading of ball-shaped fruits and vegetables, such as pomegranate, pear, apple, mango, peach, orange, tomato, potato, sweet potato, muskmelon , plum, persimmon, onion and so on. Applicable objects: Fruit juice processing line, fruit and vegetable planting cooperatives, fruit planting base, fruit processing plant, orchard worker, orchard, fruit and vegetable fresh-keeping shed, fruit and vegetable supermarket, food processing plants and etc. This type of fruit sorting machine has reasonable design, fast sorting speed, low rate of mechanical damage of fruits, high accuracy and can meet the international market standards. Multiple uses, wide application range, convenient movement and easy maintenance. Advanced design, steel structure, sturdy and beautiful. High quality stainless steel shafts, stainless steel folding plate of 1.5mm. The support and beam are welded by stainless steel tube. The transmission shaft and chain wheel are made of stainless steel 1Cr13. Low power consumption, low noise, convenient operation, high sensitivity, stable and reliable. Stepless speed adjusting device, high efficiency and large output. Unique motor guarding shield and grounding type oil guiding pipe, which provide a more sanitary condition for the sorting and grading of fruits. Advanced pre array technology. The fruits are lined up automatically by putting fruit on the conveyor belt. TICO fruit juice processing machines have won the trust and recognition of new and old customers for our excellent product quality and enthusiastic service. The satisfaction of customer is our constant pursuit of goal and motivation. Affordable, reliable quality, perfect service, welcome to inquire! More fruit juice processing machines and production line for sale! For example pineapple juice processing line.